Trees are a beautiful part of any yard, and most should be able to hold up through the winter season, but you should still give them some extra support. If you have any young trees in your yard, protect the tender bark from gnawing winter animals by wrapping stems and trunks with commercial tree-guard products or wire. For smaller evergreens, screen them from drying out in the winter wind and sun by setting up a shelter of shade cloth or burlap screens. Also, when it does snow, be sure to knock the snow off the branches of your larger evergreens. Do this by knocking the snow from the lower branches then working upward. Snow weighs down branches, putting them at a higher risk to break. Preparing your perennials for winter is a multistep process, so let’s jump right in! Cut the dry stems all the way to soil level after frost and remove lingering disease spores and pest eggs. Leave the stems that still have attractive seed heads. Compost all the dead plant debris into an organic soil conditioner. When hot, these piles kill weed seeds and disease pathogens, but cold and inactive piles do not. Dispose of all questionable plant material in the garbage. Remove all diseased foliage from evergreen shrubs and plants and dispose of that in the garbage as well. Rake up and remove old, disease-bearing mulch as well. Add a six inch layer of organic material as winter mulch after the ground freezes. This prevents rodents from nesting in the soil. Add pine needles or chopped leaves as a mulch for your perennials in order to protect both plants roots and the soil. This also moderates the effects of thaws and extreme temperature changes. Dig up tender bulbs (gladiolus, dahlia, canna, etc). Cover or wrap them with moist material and store in a dark, cool place. 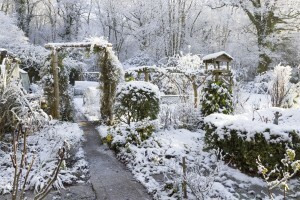 So those are our tips for preparing your garden for the incoming winter. If you need help getting your garden and grounds ready for winter, contact the experts at Greener Horizons. We will ensure your garden can survive the incoming winter and perform many other services. Also be sure to check out our Green Blog for more useful tips.